A few months ago, I discovered the Taco Cabana at 5242 N. Lamar in Austin Texas had a defective handicapped bathroom stall. The handicapped stall was missing a door. with its prison-style handicapped stall. To ensure our fellow Americans with handicaps can use the toilet with privacy- nay, with dignity- a group of civil-minded patriots (mostly Jake Sharon) began the cause to get a door added to the Taco Cabana handicapped stall. Jake Sharon's wife, Callie, was not pleased with how he was "wasting your free time." Here is a link to the original article: 5 Reasons Why Taco Cabana Needs A Door On The Handicapped Stall. Good news: I am very excited to announce WE DID IT! Below is the story of our success. And when I say our success, I mean we couldn't have done it without YOU! After a blood, sweat and tears and Earth, Wind And Fire social media campaign, our GoFundMe campaign is only $5 short of our funding goal. We couldn't have done that without YOU! 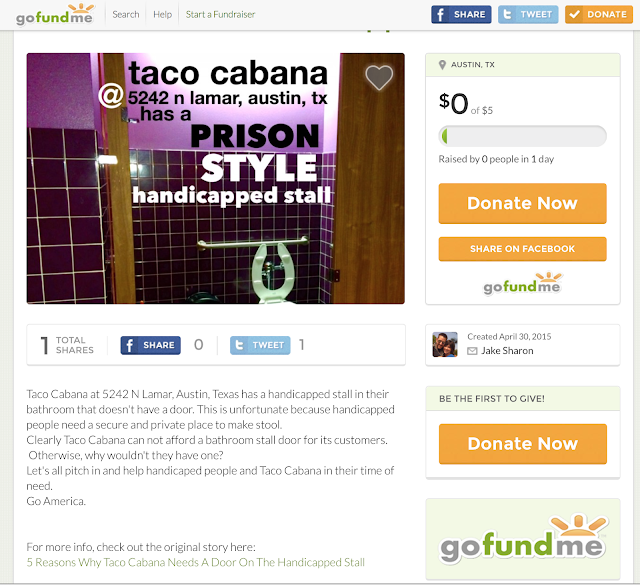 The fundraiser to get a door added to the Taco Cabana handicapped stall is within $5 of their goal! 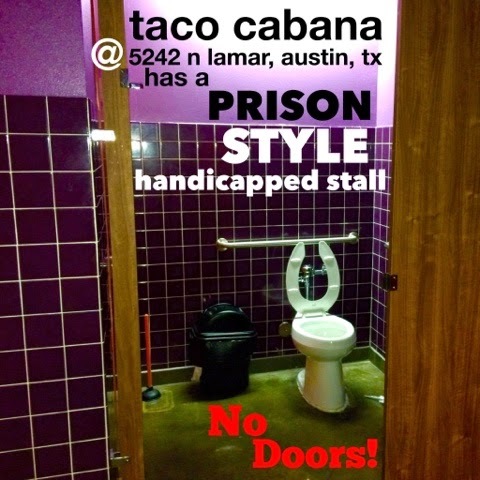 Seventy five days ago, Taco Cabana spokesperson, Todd Coerver tweeted me Taco Cabana put a door on the handicapped stall! Our squeaky wheel got the grease! Now there is a squeaky greasy door at Taco Cabana! We couldn't have done it without YOU! Of course, as a credible journalist, I don't just take the word of any taco franchise spokesperson. I asked my friend, Scott Hearne, to take pictures in the Taco Cabana men's room. Scott eagerly took the men's room photos. He also took a picture of the Taco Cabana handicapped stall- which shows there is indeed a door! Success! We couldn't have done it without YOU! Institution Theater owner Tom Booker appears without permission. Tom Booker used to date Ricki Lake and Kathy Griffin. Later, Kathy Griffin had plastic surgery on her hooha. She talks about that on stage. Our GoFundMe campaign is still going. It's not too late. We can still do some good. I just moved to South Carolina and I found a messy bathroom stall at the Bojangles. I could use the $5 to get some Boberries while I plot my next save-the-day campaign. Here is a link for when you decide to contribute: http://www.gofundme.com/tacocabanadoor.